Mar 11, 2012: Two copies of “Titanic, A Search For Answers” in paperback are up on Ebay. Both will be inscribed and autographed. Follow the links to find out which one has the best price. http://r.ebay.com/5a91P1 or http://r.ebay.com/tu2Lr0 Good Luck ! Mar 6, 2012: So far in my ongoing series “RMS Titanic” (excerpts from my soon-to-be-released book) I have covered; the sequence of events that happened on the bridge, that Titanic had to have started to turn to the right before hitting the iceberg, how to tell the difference between Titanic & Olympic, and I have covered part of my research methodology. For the next few weeks my articles will cover how the Titanic broke up and arrived at the bottom in the condition we see today. 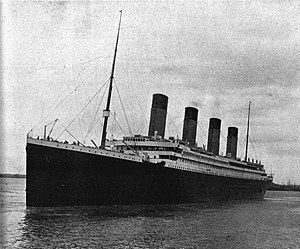 My article on March 11, 2012 will cover Titanic’s missing number one funnel. Each group, from Dr. Ballard’s first group to today, has been unable to find any of Titanic’s four smoke stacks. Why aren’t the funnels in the debris field? Where are they and what happened to them? I believe I know where the number one funnel is and why it has not been found. In Sunday’s article I will layout my case giving you the latitude and longitude where the search should begin. One day in the future a group of explorers will find titanic’s famous number one smoke stack. However, you’ll be able to say “I knew it was there years ago, I read that at http://www.joeccombs2nd.com”. Feb 21, 2012: Now you can rate comments and pages. This will help me give you the information you want. Jan 24, 2012: Today I turn fifty years old, funny I still feel like thirty-nine (thank you Mr. Benny). I have several pieces I am working on now. I am putting the finishing touches on “Christmas Patrol”, trying to track down a few more bits of information. Also, against my better judgement (but at the insistence of my staff) I am writing another Titanic book. Walter Lord did a great job telling the Titanic story as a narrative from the passengers point of view and I felt it was important to do the same for the crew. It has been difficult finding primary source material about many of the crew’s final hours. I think you will be pleased. Some of the information I have discovered will challenge some of what we already know and think we know about the sinking of the Titanic. For this reason the first part within the book will be the narrative and the second part will be the evidence the narrative is based on. I believe publishing the evidence with the narrative is important to allow other Titanic researchers to verify my sources and the quality of the evidence itself. I enjoy and appreciate all your comments. keep up the great work , I read few content on this site and I believe that your web site is very interesting and has sets of wonderful info . It is on the rightside of the page. That’s the kind of article I like to read, perfectly written with great content. I would like to start a blog on the same subject but I’m not as good a writer as you are! keep up the good piece of work, I read few content on this web site and I conceive that your website is rattling interesting and contains lots of great information. E-mail us through the contacts page and we will see what we can do. Tell us which post you selected “Notify me …” on. WordPress is our web host we might have to go through them. We have not heard this from anyone else. You should be able to de-select notify me at the bottom of the e-mail notification. I just want to tell you that I am just very new to blogging and site-building and honestly enjoyed your blog site. Most likely I’m planning to bookmark your site . You surely come with excellent well written articles. Regards for revealing your website. Mr. Combs, I look forward to reading your upcoming book on the Titanic. Since you are a former U.S. Navy Submariner, I feel certain that your perspective will be different than that of other information I have read on the sinking of the Titanic. It is also refreshing to see an author do extensive research before, and during, the writing of a book. Please thank your staff for asking you to write this important book.